The motorcycle protection vest with airbag must detect the accident, activate the inflation and also protect effectively. The Helite protection vest helps to prepare for the impact and minimize its consequences. Indeed, before the impact the airbag inflates near the body to stiffen and keep the trunk in neutral position. During the impact, the impact energy is absorbed and dissipated over the entire surface of the motorcycle protection vest. The energy of the shocks transmitted to the airbag vest is absorbed and distributed on all over the protection. A motorcycle protection vest that absorbs effectively is the combination of: geometry, volume, textiles, gas circulation in inner tubes and pressure. Below, a small explanation on the importance of optimum pressure in a motorcycle protection vest. 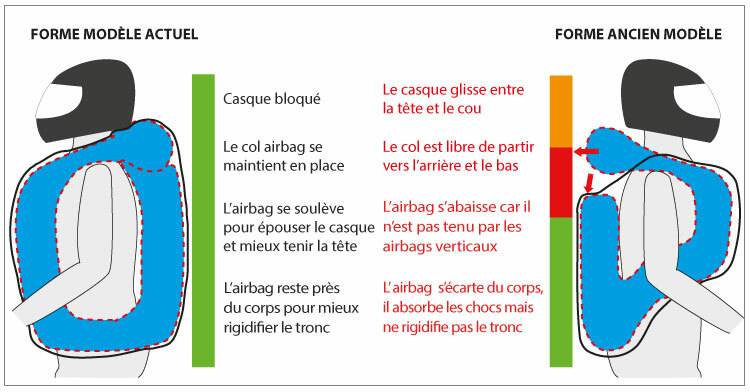 The shape of the airbag protection vest must also be optimized for proper protection. 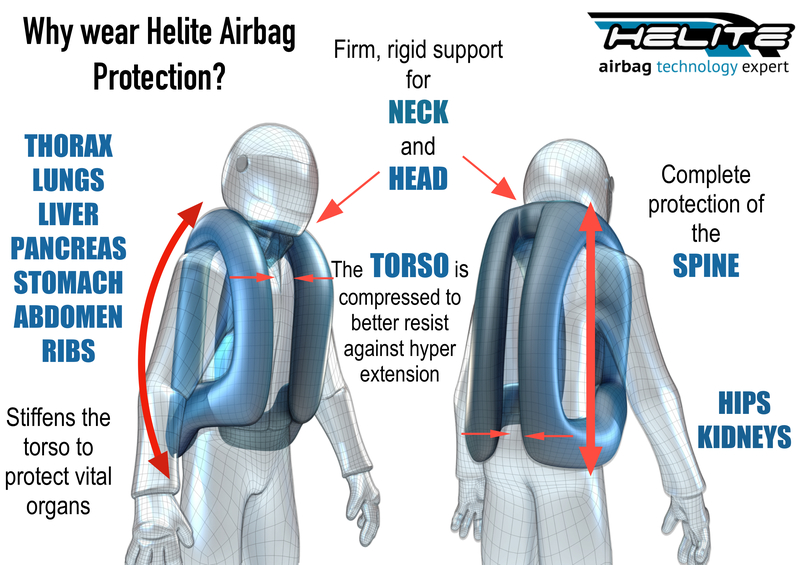 After numerical tests in partnership with the University of Florence (specializing in accident analysis), we concluded that by connecting the vertical airbags of the back to the airbags of the neck, the head was much better blocked to the rear. An advantage to avoid neck clash and brain damage. Here is an illustration of the motorcycle protection vest before 2010 and after.